In Schiedam, the Netherlands, Mammoet became the world’s first user of Van Beest’s Green Pin Tycan chain for lifting. This product has been made with Dyneema, one of the world’s strongest fibre. The Green Pin Tycan has similar characteristics than a steel chain regarding strength and flexibility, and is also « eight times lighter », as stated the Dutch company. This event was attended by Managing Director Mammoet Europe and Russia Wouter Van Noort and Anton Van der Zalm, Vice President Research and Development at Van Beest. At Mammoet, we pride ourselves on always looking for new, innovative solutions to exceed the highest safety standards. Green Pin Tycan helps us achieving that », commented Wouter Van Noort. 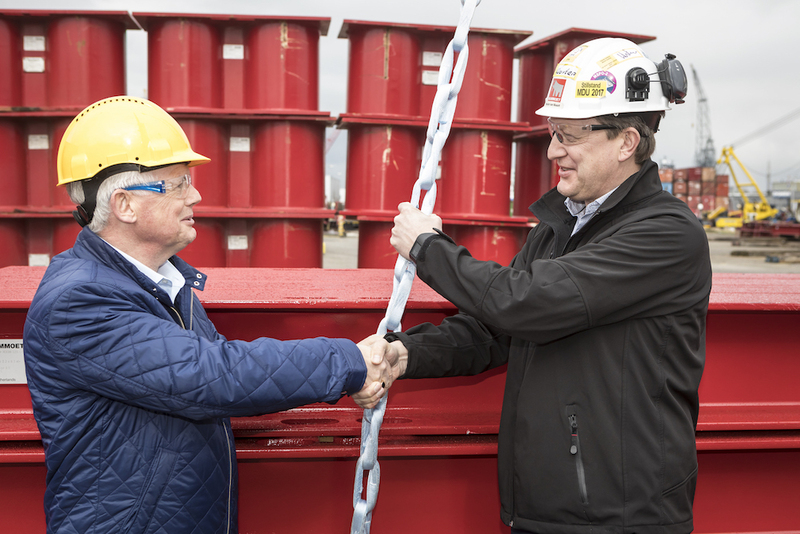 In another hand, Anton Van der Zalm added he was « delighted that world leading companies like Mammoet see the benefits of using it for both lashing and lifting ».